I have declared a couple of parameters in my mapping configuration. I may be blind, but: where can I set them? You can set them in "mapping configuration"
The only way to pass parameters into generator is to create your own facet and participate in MPS make process. When you press Ctrl-F9, or click on the "Make project" button, MPS tries to figure out how to build the selected modules. First, it looks through all used languages in the selected scope and collects facets from them (if there are any). Facets consist of targets. All targets are ordered according to their dependencies and executed one by one. 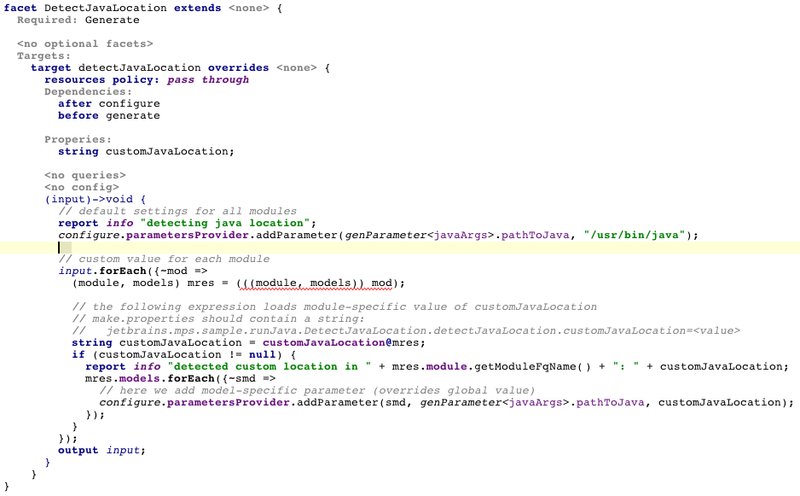 To be able to push parameters you need to insert your target somewhere between configure and generate. 1. Declare parameters in a separate model. 2. Use parameters in generator. Create plugin aspect in your language. Import two languages: j.m.make.facet and j.m.lang.generator.generationParameters. Make allows to declare per-module parameters in a special make.properties file, which should be placed in the same folder as module file. b. Create make.properties file in the module's folder.